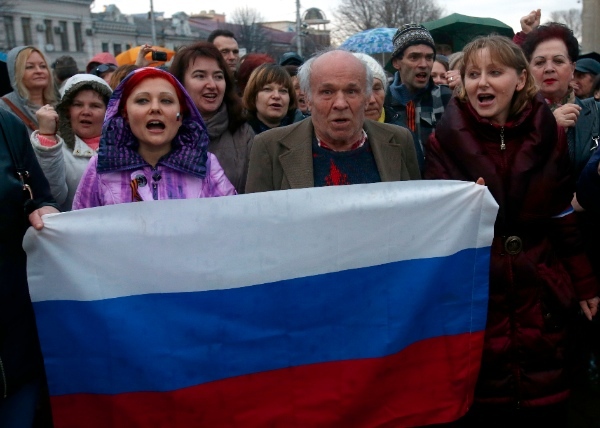 Members of parliament in Crimea on Thursday voted to secede from Ukraine and become part of Russia. On March 16, Crimeans will now vote to approve that decision or restore the 1992 Crimean Constitution, whereby the peninsula would remain an autonomous republic within Ukraine. The referendum was originally scheduled to be held May 25, the same day as Ukraine’s early presidential election. The ballot, to be printed in the Russian, Ukrainian and Tatar languages, will include only those two questions, according to the official Crimean statement. Crimea is an autonomous republic within Ukraine where Moscow has a naval base. The 2001 Ukrainian Census figures show 58.3 per cent of the Crimean population are ethnic Russians. Rallies around the predominantly Russian-speaking peninsula following the formation of the new government in Kiev have openly called for secession and annexation by Russia. Crimean officials have refused to recognize as legitimate the new central government in Kiev, which ousted President Viktor Yanukovych on February 22. For much of the past 200 years, Crimea was under Russian and Soviet control, and most Crimeans see themselves as only nominally Ukrainian.